A good start to the week – my beloved Detroit Tigers won the first of three against the division rival (and division leading) Kansas City Royals yesterday afternoon, closing the pennant gap to one. The Detroit Lions beat up on the New York Giants last night on Monday Night Football to kick a new season off the right way. And the temperature here in Detroit leads one to think autumn is right around the corner. My favorite time of year. For this week’s Bourbon of the Week, however, I return to those dog days of summer. I was fortunate enough this year to accompany my lovely wife on a work trip to Los Angeles back in July. It was a fantastic trip, full of sun, beaches, wonderful entertainment and great food. We got to see Chris Isaak (a favorite of mine) at the Hollywood Bowl, and take in a show at the Comedy Store, including Marc Maron and Ralphie May. But, while LA has all the glitz and glamour, there is one thing it is definitely missing: bourbon. Now, that’s not to say I didn’t find some good times and good bourbon. A visit to the Dresden made me feel like I was in Swingers, and three fingers of Maker’s Mark certainly helped with that. But from establishment to establishment, it was more of the same: Jim Beam, Wild Turkey and Makers. No Buffalo Trace, no Woodford, not even Knob Creek. Finally, I went online to find somewhere in this sprawling expanse to procure a glass of something…special. And sure enough, I found it, in Hollywood, of all places. The bar is called the Township Saloon, and I will review the bar itself in the near future. It’s a cool, hipster-meets-divey bar on Sunset, away from the Hollywood hullabaloo, and on that Friday night, kind of quiet. Perfect for sampling one of the rarest of treats, because they had George T. Stagg. For some reason, I have been unable to locate a bottle of GTS in Michigan, even third party, and Kentucky has fared me no better. So I was excited to take a drink of this much respected and crowed about product for myself. 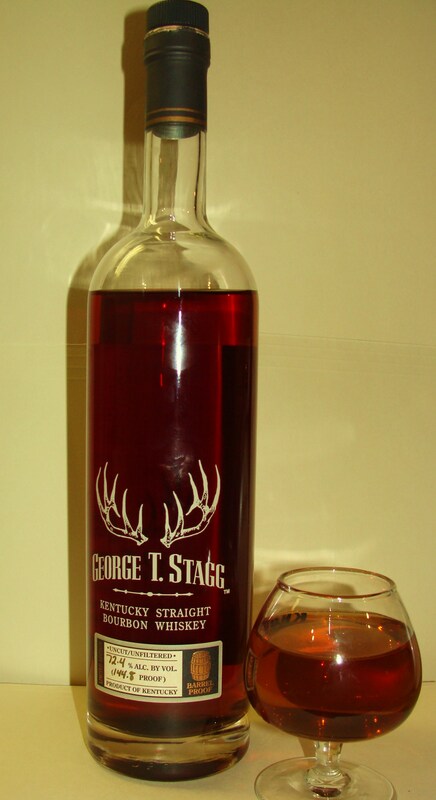 Some say George T. Stagg is the best bourbon made – another fine member of the Buffalo Trace Antique Collection. It’s age varies (I have been told the 2013 was 16 years old), and it is a proud product of Buffalo Trace mashbill #1. It has a very high proof – 129 on this bottling – so a keeping a little ice handy isn’t a bad idea, although I first tried it neat. After all the raving I’ve read, I was looking forward to trying it. The nose took me a minute. Like most high proofed bourbons, the alcohol sears a bit on first blush, and should be given a minute to breathe. Then, the world opens on this glass. There was a dark sweetness to it, toffee and caramel, but not overwhelmingly so. Plum, raisin peeked through, maple sugar, and a soft oakiness that was dry and had a hint of tobacco. The taste was dark as well. The toffee remained, along with an almost dark chocolate character. There was a hint of bitter, like coffee, before giving way to a wood that seemed fresh. It is a strong drink, so I added a few ice chips, and found the sweetness seemed to dissipate a bit, while the oak and slight bitter remained. The finish was surprisingly short for such an aged and high-proof pour, although I did get hints of cinnamon on the back end. Did I enjoy it? Thoroughly. Is it in my top five? Well, not this years, but that just gives me a reason to try again next year.